Life is grand wearing these comfortable casuals from Crocs. The lightweight, comfortable, and waterproof upper in a slip on clog style, with a roomy, rounded toe, portholes for ventilation and front strap that flips to create a secure heel strap. Odor-resistant interior and cushioned footbed. Shock absorbing midsole, non-slip, non-marking sole. Dishwasher safe! Hop on a boat, stroll on the beach, or walk to a meeting, CROCS shoes are the most comfortable and versatile shoes you'll ever own. 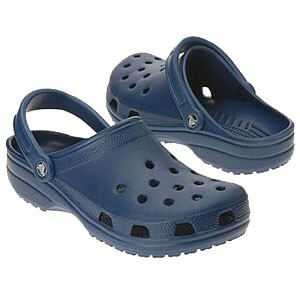 CROCS shoes are a new breed of shoe that mixes the comfort of clogs with a space age material that has incredible benefits. The special Proprietary Closed Cell Resin (PCCR) warms and softens with your body heat and molds to your feet. The European styling of the orthotic heel, built-in arch support, and tarsal bar position your feet for ultimate foot comfort and health.